An all-star lineup of some of the most successful and accomplished rock ‘n’ roll musicians in Twin Cities history will join Rick Shefchik as he introduces his new book, "Everybody’s Heard About the Bird: The True Story of 1960s Rock 'n' Roll in Minnesota," at the Electric Fetus on Wednesday, November 11, at 7 p.m.
Rick will host a discussion and jam session with Tony Andreason of the Trashmen (“Surfin Bird”), Dale Menten and Tom Klugherz of the Gestures (“Run, Run, Run”), Jim Johnson and Doni Larson of the Underbeats and Gypsy (“Footstompin’,” “Gypsy Queen”), Jim Donna of the Castaways (“Liar, Liar”), Larry Wiegand of the Rave-Ons, South 40 and Crow (“Evil Woman”), Phil Berdahl of the Stillroven, Ron Butwin of the Escapades and Mike Waggoner of the Bops. Afterwards, Rick and the musicians will sign copies of the book. Everything old became new again, if only for a night, as the spirit of 1960’s Minnesota rock ‘n roll was alive and well at a packed book release party. The celebratory event was held at the Electric Fetus record store in Minneapolis last week, promoting of Everybody's Heard about the Bird: The True Story of 1960s Rock 'n' Roll in Minnesota by local author and longtime newspaper man, Rick Shefchik, and featured all-out party music from the likes of The Gestures, The Trashmen, and The Del Counts to an overflowing crowd. The book itself is a behind-the-scenes, up-close-and-personal account, relating how a handful of Minnesota rock bands erupted out of a small Midwest market and made it big. From Augie Garcia and Bobby Vee to The Trashmen and The Castaways, Everybody’s Heard about the Bird reveals how this monumental era of Minnesota rock music in the 1960s evolved. Author Shefchik both MC’d the event as well as signed books (along with all the musicians present) and all 150 copies brought, disappeared to eager buyers, within minutes. After a Gerry and the Pacemakers cover, the band ended their short set with their own ‘Don’t Mess Around’ and national charting hit, ‘Run, Run, Run’. Members Tony Andreason and original bassist Bob Reed of the legendary Trashmen were coaxed on stage next, for a two-song hit parade of Buddy Holly and Jerry Lee Lewis songs, though unfortunately did not play the song the book was named after. After a short break, the Gestures returned with Del Counts guitarist Steve Miller to blaze through Chuck Berry’s ‘Let It Rock’ and a cover of ‘Let the Good Times Roll’ which the Del Counts had also recorded as a 45 for Soma Records back in the day. The Gestures closed the evening with a slower Gene Pitney cover, then decided to rev things back up with Chuck Berry’s ‘Nadine’, to end the event on more of an exclamation point, to a mostly older but all very appreciative crowd. Rick Shefchik continues his area book tour for Everybody's Heard about the Bird: The True Story of 1960s Rock 'n' Roll in Minnesota, with his next appearance being THIS Saturday in Woodbury, at the Sound+Vision MN Pop Culture Collectibles Show. Though winter’s cold bite is upon us early, there are still a few pop culture-related events, worth getting out of the house for. Sound+Vision MN is a Pop Culture Collectibles show in its third year that brings together selections of vintage and current, rare and hard-to-find music (Vinyl, CDs, concert DVDs), comic books, toys, science fiction, horror and fantasy memorabilia and more, to a 3x annual show held at Valley Creek Mall in Woodbury. For the latest installment, happening this Saturday, November 22 (9am-3pm), the show features Image Comics writer/artist Otis Frampton as its special guest and a chance to win early The Hobbit: Battle of the Five Armies advance screening tickets and prizes. Frampton’s latest comic, an all-ages book called Oddly Normal, has its third issue out the following Wednesday, and he’s also involved in the YouTube popular How It Should Have Ended animated shorts, along with his own ABCDEFGeek. Other promotions are on-site and the admission and parking are Free, for this one-of-a-kind east metro show. If it’s this cold and snowy out in November, will people go to a comic-con in early February? That’s the hope, as Wizard World expands its nationwide pop culture shows for 2015, adding a show in Madison, WI at the Alliant Energy Center on Feb 6-8, 2015. Wizard began extending its reach last year, with the inaugural Wizard World Minneapolis and the company hopes for similar success across the border. Media guests announced so far include William Shatner, Eliza Dushku, George Wendt, Michael Rooker, Edward James Olmos, Billy Dee Williams, and Batman's Adam West and Burt Ward (perfect to get that long awaited TV series box autographed!). Comic book creators include Mike Grell, writer Gary Carlson, and up-and- coming Marvel Young Gun artist, Valerio Schiti. Cosplay contests, celebrity Q+A sessions, and industry panels are all part of the weekend. Locally, the longtime two-day SpringCon has rebranded itself as the MSP Comicon, likely in response for Wizard coming to town and to take advantage of the “Comicon” branding term. The 27th annual show will be held May 16-17 in the Grandstand at the Minnesota State Fairgrounds and features 100,000 square feet of comic book-centric collectibles. Known as a fan and creator friendly show, the organizing volunteers suffered a heavy loss when Source Comics and Games co-owner Nick Post unexpectedly passed away, but the Midwest Comic Book Association carries on in his honor, to deliver a show that is both fun and satisfying to the comic book aficionado. Taking place on May 2-4, 2014, at the Minneapolis Convention Center in Minneapolis, is the inaugural Wizard World Minneapolis Comic Con. If you grew up in the 90s, you probably collected Wizard Magazine, as I did. They were great, I love getting those free trading cards, and then eventually the 1/2 exclusive comic books. Unfortunately, like so many things that the internet destroy, Wizard slowly died. Founder Gareb Shamus was smart enough to invest in comic book conventions... so that's how Wizard World Conventions came to be. The latest city to join the Wizard World family is Minneapolis. Personally, I'm really excited about this because I feel that for the first time, Minneapolis will be getting some A-list stars, such as William Shatner, Robert Englund, Ultimate Warrior (UPDATE: The Ultimate Warrior passed away as of 04/08/14), and much more, that only a major player like Wizard can bring in. I've previously attended Crypticon 2008 and Crypticon 2009, which featured some horror stars, but it's nothing compared to this upcoming Wizard World Convention. As for the comic book side, because technically this is still a "Comic Book Convention", I recognized many of the artists they booked: Neal Adams, Michael Golden, Mike Grell, Greg Horn, Barry Kitson, Bob Layton, Kevin Maguire, Ethan Van Sciver, and much more. Among all these artists, I really love Michael Golden, whose linework reminds me of Brian Bolland or Steve Lightle. Read the full press release at news.weheartmusic.com. Meanwhile, the SpringCon is taking place a few weeks after Wizard's convention: May 17-18 at the usual Minnesota State Fairgrounds. I have been going on and off for many years, from that hotel near Mall of America to the much larger Minnesota State Fairgrounds. Some benefit to SpringCon: free parking, and affordable entry ($12 for both days). You can bring a can of food and get $1 off. We went to the last Fallcon 2013, and there wasn't a schedule/programming and with fewer guests (but, then again, it was also cheaper: $8). Looking at SpringCon's list, it would seem that SpringCon, at least this year, is much bigger. The artists I recognized were: Peter Gross, Gene Ha, Dan Jurgens, Adam Hughes, Doug Mahnke, and Gordon Purcell. I'm sure I missed a few times scrolling through their massive list. I've gotten comic books signed before at these MCBA shows, and it's always free (or donations - but they usually go to a charity). If you're into original artwork, getting an commissioned artwork is usually pretty easy. Unless an artist is really popular, you can usually get them to draw your favorite comic book characters. I've seen prices go from quick sketches for $20 to as much as $200 depending on how detail the artwork has to be. Personally, collecting original artwork can be quite expensive (although I own my fair share of original artwork), instead, most of my money usually goes to getting good deals on old comic books. Sound+VisionMN's upcoming show is this Saturday, March 22, at the Valley Creek Mall in Woodbury, Minnesota. Their special guest for the show is comic book artist, Gordon Purcell (who is also appearing at SpringCon). Although I tend to think of his artwork is more cartoony (Ben10), he actually started his career as a more 'realistic' artist with Star Trek. Also, random trivia, I actually own his first DC published work in the Bonus Book in The Flash #12 (May 1988). Sound+VisionMN, a Music, Comics, Pop Culture, and Toys Collectibles Show / Sale returns to Valley Creek Mall (1750 Weir Drive) in Woodbury, MN on Saturday March 22, 2014, from 9am-3pm. This Free Admission event features dozens of dealers selling a wide variety of vintage and current music (vinyl, CDs, tapes, DVDs), comic books, toys, pop culture, movie memorabilia, and anything else related. Our special guest for the show is acclaimed comic book artist, Gordon Purcell! Working in comics since the mid-1980’s, he is best known for his Star Trek art for both Marvel and DC Comics, and is the current artist for Cartoon Network property Ben10 (IDW Comics) and Protectors, inc. (Image Comics). Additionally, Sound+VisionMN is partnering with Allied THA for an exclusive Captain America: The Winter Soldier event, to offer a fun chance to win free advanced movie screening passes, t-shirts, and posters for the upcoming Marvel Studios blockbuster, which opens in theaters on April 4th. Attendees will be the first in the area, to see this hotly anticipated movie! The location features plenty of free parking and on-site/nearby amenities to make the day an enjoyable one. Also happening this Saturday is Action Casting for Spidey fans. If you think you know all there is to know about Peter Parker and the Amazing Spider-Man, then head over to the Mall of America this Saturday from 10am to 6pm. They encourage you to dress up in your favorite Spidey costumes. Winners will be flown to New York or Los Angeles for the premiere, where I'm assuming you get to mingle with the stars of Amazing Spider-Man 2. ACTION CASTING is looking for knowledgeable and enthusiastic Spider-Man super fans to audition for a once-in-a-lifetime experience! Come see us SATURDAY at the Mall of America and you may get an opportunity to swing like Spidey, meet a cast member, or go behind-the-scenes of the new movie The Amazing Spider-Man 2. Five people will be selected to be featured in a promotional campaign which will air across the networks of NBCUniversal. Free Comic Book Day 2014 is taking place this May 3rd. Perfect timing, really, especially with Wizard World Convention and MCBA SpringCon in the same month. I've been going to Free Comic Book Day since it started. I've watched how it's grown. It's really incredible how big it's gotten. It used to be that I'll go to my local comic book store and can still get all the free comics. Now, by the time I show up to the comic store, they "sell out" of all the free comics (or at least have really bad selections). I'm not complaining, I think it's awesome that there are more interests in the event. Last year, the coolest thing I got were these Iron Man FCBD Heroclix figurines. I also thought the Walking Dead FCBD was cool too. I looked over the comic book list for 2014 and didn't see Marvel. I'm assuming they'll unveil the comic books closer to the May date. Free Comic Book Day is a single day - the first Saturday in May each year - when participating comic book shops across North America and around the world give away comic books absolutely FREE* to anyone who comes into their stores. *Check with your local comic book shop for their participation and rules. In Minneapolis this Saturday? Here is what's happening on November 23rd. Looking for something to do over the weekend? The Pines are doing a residency of sorts at the Cedar Cultural Center tomorrow and Saturday (November 22nd and 23rd). We are covering their Friday show. According to their website, The Cedar is one of their favorite Midwest venues, and for good reasons: the sound is fantastic and the stage is just perfect for music. Also announced in 2014, The Pines will be doing a number of dates with Trampled by Turtles. Just a reminder that Toad the Wet Sprocket will be stopping in Minneapolis at Mill City Nights this Saturday, November 23rd. If you cannot make it to the show, fear not, we'll have a review of it for you soon. They are in the middle of a tour in support of their Kickstarter-funded album New Constellation, which was released last month (October 15th). 12/07/13 "KFOG Concert For Kids"
Sound+Vision MN, a Pop Culture Collectibles Show featuring Music, Comics, Toys/Action Figures and Movie Collectibles Show / Sale returns to Valley Creek Mall (1750 Weir Drive) in Woodbury, MN THIS SATURDAY from 9am-3pm. This Free Admission event features dealers selling a wide variety of vintage and current music (VINYL incl. Japanese imports, CDs, DVDs); comic books; toys/action figures; Star Wars/Star Trek, Walking Dead, Game of Thrones, Harry Potter, sports and sci-fi items, vintage games, movie memorabilia, and anything else related. Great items to add to your Collection or anyone on your Holiday Gift List! Free Prizes-- Spin-to -Win for chances at Avengers T-shirts, Mall gift certificates, and more! Play Rock 'Em Sock 'Em Robots with winners receiving FREE advance screening passes to GRUDGE MATCH (Stallone vs. DeNiro!) for Dec. 12th at MOA! The location features plenty of free parking and on-site and nearby amenities to make the day an enjoyable one. This Saturday (tomorrow, April 13th), there is the Sound+Vision record show at the Inside Valley Creek Mall in Woodbury, Minnesota. Hopefully by tomorrow, sun will be shining. WHAT : the area's newest Collectibles Show featuring new and used, vintage, rare and hard-to-find Music (VINYL, CDs, DVDs), Comics, Pop Culture, Toys and Movie Items and Memorabilia! Attention Trekkers: If you go to the show, there are free posters to Star Trek: The Next Generation, the Best of Both Worlds and a chance to win free tickets to see The Special Fathom Features: The Best of Both Worlds in Brooklyn Center on April 25th (next, next Thursday). The two-part storyline comprising the third season finale and the fourth season premiere. Also, get a chance to win a pair of tickets to see Gordon Lightfoot at his upcoming show in Minneapolis on April 29 at the State Theatre. With Record Store Day 2013 happening next Saturday, Electric Fetus music store is holding a special live music event on Saturday, April 20th, 9:00 a.m. - 8:00 p.m.
Record Store Day: Our favorite national holiday! There will be food & beverages, prizes & giveaways, live music from local & national acts, and of course exclusive releases. - Free Intelligentsia coffee from Angry Catfish Bicycle Shop & Coffee Bar for the first 500 java lovers. - Glam Doll Donuts - while supplies last! - Natedogs and Hola Arepa food trucks will be on site throughout the day. - Angry Catfish Bicycle Shop will be in our garage providing free bicycle safety checks for the pedaling patrons. - Hourly giveaways! Prizes include Fetus gift cards, concert tickets, vinyl and CDs (must be present to win). - Free goodie bags with purchase (while supplies last). As you know, I am one of those rare people that dislike Spotify. The problem with free version of Spotify is that you're tied to your computer. Most people listen to music on their mobile device, such as a modern phone. If you have a Nokia Lumia phone, the good news is that you can get Nokia Music, an advertisement-free. Also, an added perk is that it doesn't require you to sign in, it is complete free, unlimited plays, and best of all, you can listen to it offline. I don't actually have a Nokia phone, but reading about Nokia Music, I really want to switch phones just to check out this service. Recently Nokia Music announced a new music documentary series, featuring six short films about the music landscape in six cities from independent directors Abteen Bagheri, Emily Kai Bok, Bob Harlow and Tyrone Lebon. Jyrki Rosenberg, Global Head and VP, Nokia Entertainment had this to say about the upcoming project, "Music has always inspired various forms of pop culture and since music and film have always gone hand in hand, the idea to produce a music documentary came naturally. We are also excited to work with these emerging filmmakers and see America's different music scenes through their eyes. We look forward to shedding some light on music communities that are rarely put in the spotlight." Look for the Nokia Music documentaries to air on Sundance Channel in January 2013. This record show happening tomorrow, November 17th, at the Inside Valley Creek Mall in Woodbury, Minnesota. Attendees can get a chance to get free advance screening for "Hitchcock" and a pair of tickets to see Kathy Griffin (show at the State Theater on December 1st). In addition to the music shopping, the free show also includes comics, movies, and collectibles. You usually find baseball cards or various pop culture items at this sort of show. 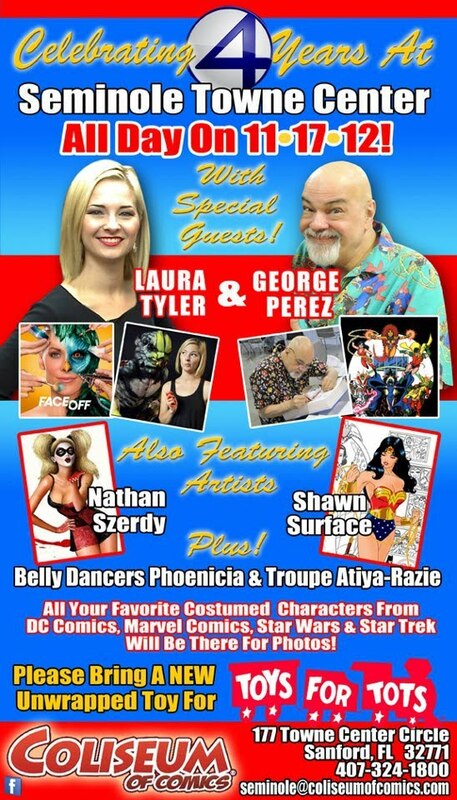 One of my favorite artists, George Perez (artist from Crisis on Infinite Earths, JLA/Avengers, and Teen Titans), will be appearing at the fourth anniversary of the Coliseum of Comics store in Sanford, Florida. If you live in the area, you should check it out. If you want to commission a quick headshot of your favorite comic book character, Perez is currently charging $40. It used to be cheaper, but then the Canadians ruined it. We've mentioned Blondfire a few times, so I thought I'd throw this in briefly. Glass Theory (real name Jack Duff) just released a "sensual EDM remix" of Blondfire's song "Where The Kids Are." The Crystal Ship (real name Sebastian Altamirano) is a producer/DJ/remixer from Buenos Aires.